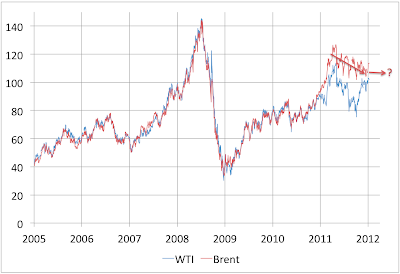 I have been generally bearish on (Brent) oil prices for the last few months on the reasoning that the situation in Europe had to get worse before it got better. I am becoming less certain about the direction of prices in early 2012. Obviously, a bond that a bank created for the sole and express purpose of pledging as collateral to the central bank is not a "good" security in the sense intended here and the need for these measures suggests that is currently not the case that the "amount of bad business in commercial countries is an infinitesimally small fraction of the whole business". This suggests to me that Europe is moving to a Japan style solution in which large numbers of zombie banks are kept afloat by the authorities (for fear of the disaster were they to collapse) and gradually earn their way out of trouble but in the meantime inhibit the economy by their very cautious lending. Combining that with fiscal austerity all round suggests a long grinding stagnation in Europe. Still, that is a very different thing than an abrupt crisis, and in particular need not be associated with a large crash in European oil demand. And on the other hand we have the low level undeclared war being fought against Iran with a steady drumbeat of mysterious explosions and assassinations (the most recent just yesterday) as well as ongoing efforts to prevent Iran from selling its oil. Iran in turn is making threats about the Straits of Hormuz. Whether this is all bluster that will pass over without major ramifications is tough to say. 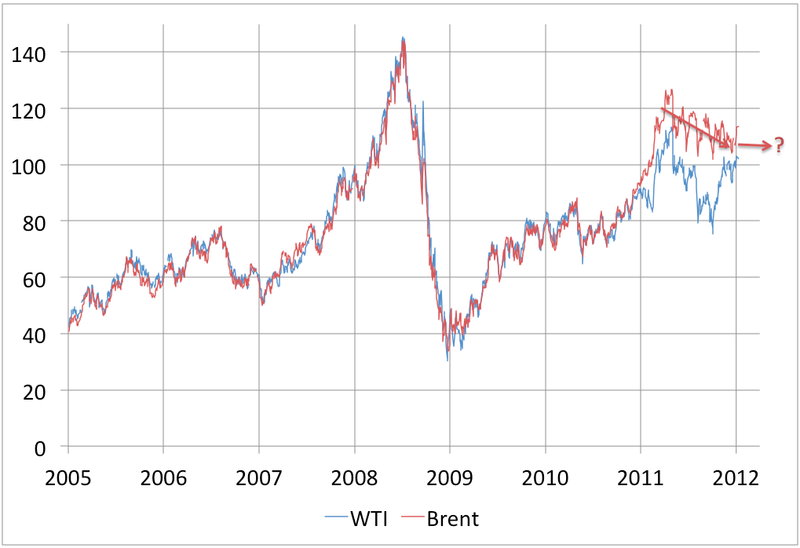 And therefore I am now quite uncertain about the future direction of oil prices. 60 Minutes had a profile of Cristine Lagarde a month ago. It's worth watching, and left me with the feeling that she had the mental horsepower, chops, and balls to pull out all the stops, with the goal of extending and strengthening extend-and-pretend. She didn't say this, but you got the impression that she wasn't going to let the Euro sink on her watch. Curious as to your thoughts about North American Natural Gas. Particularly with regards to oil sands operating margins. Any thoughts/analysis would be appreciated. Considering Europe is a big oil importer, if "saving the banks" has a side effect of keeping oil demand higher than otherwise, saving the banks also has the side effect of, in a slow economy, sending what money there is, to the Middle East. Meanwhile Americans still buy SUVs and have their almost zero gas tax. Not to mention Exxon moving on Kurdish oil. How about a little clownish "singularity theory" Stuart ? The techno messiah religion is over or what ? When will the situation "get better"? Axelander Ac > When will the situation "get better"? You mean, return to the 1980-90s of cheap gas, growing private sector credit and low commodity prices? If financial history is any guide, maybe another decade and a half. If peak oil is true and we dont transition to an alternative in a reasonable fashion (which we dont seem to be doing, or even contemplating); maybe not until the US experiences a drastic standard of living decline like the Soviets experienced (except worse), and even then, only in the rest of the world, assuming they still exist and are not ravaged by the effects of climate change and water issues.